It's 2.30pm when we walk into Om Nom at the Adelphi Hotel for High Tea, but the moody lighting, dark sheer curtains and bar to the right makes it feel like cocktail hour. 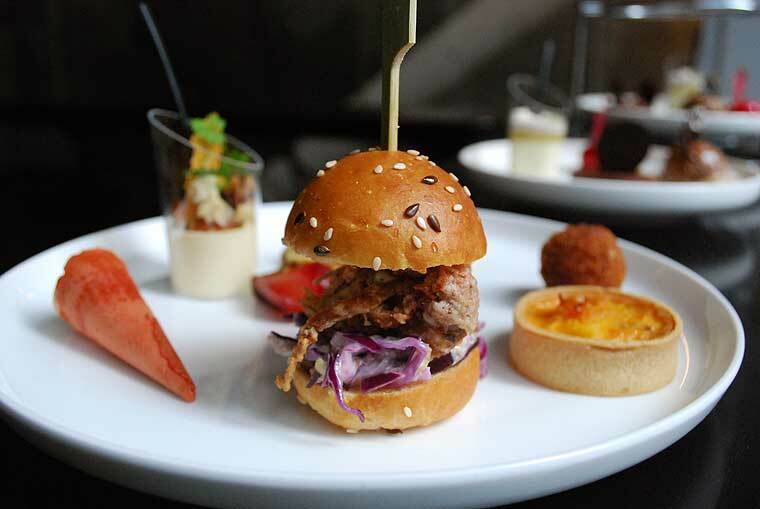 Located in the lobby of the Adelphi Hotel, which is famous for its rooftop pool deck that juts out ever-so-slightly over the rest of the hotel along Flinders Lane, Om Nom has a chic interior with couches that are suspended from the ceiling lining one wall, and felt-back chairs circling the tables. The dessert bar has long held a reputation for its theatric desserts – including chocolate and rosemary infused cigars served in a smoking cigar box – and equally dramatic signature cocktails. It’s this sense of fun and innovation that epitomises Om Nom’s latest high tea menu, which is revamped seasonally. 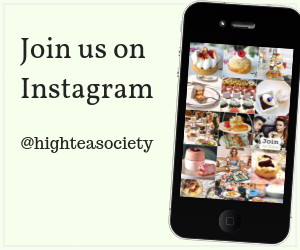 There’s not a finger sandwich or scone to be seen, but what it does feature are unique and quality ingredients that you won’t find in many traditional high tea offerings, including soft shell crab and Valrhona chocolate from France. We start off with a glass of Verechon and Clerc French sparkling on arrival (there’s also a selection of mocktails for non-drinkers) and offered coffee or a selection of black, green, herbal and fruit teas. The menu is served in two stages, with each guest receiving their own plate of savouries. This is where you get that soft shell crab, loaded into a slider with coleslaw for a thoroughly non-traditional but delicious starter. Another stand-out is a beautifully smoked chicken mousse served in a mini cone, while a savoury parmesan panna cotta served in a glass and topped with quince is an unusual but welcome item. Dessert is served on a three-tier stand, with the bottom tiers set out as individual dessert plates and the top tier featuring Milo-flavoured macarons and handmade truffles and meringues on sticks. The top tier desserts are arranged within a patterned teacup and saucer, adding a touch of whimsy to the overall look. 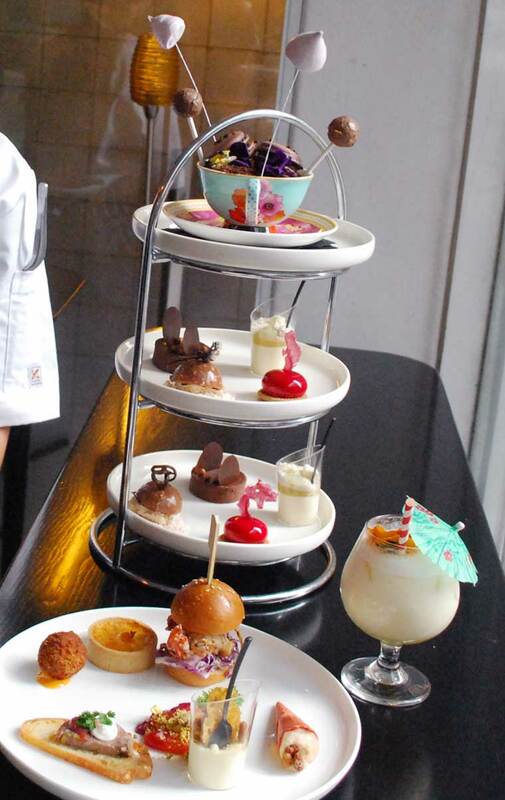 Pastry chef Elisha Kesici, whose resume includes Vue de Monde, said Om Nom’s high tea attracted a lot of families with kids, which inspired the design and taste of this top tier in particular. For me, the chocolate-inspired desserts were the heroes of the day, with the chocolate truffles pure decadence, and a tartlet featuring Valrhona Jivara was incredibly rich. But that’s not to discount the visually stunning and equally delectable glazed cheesecake, and the sweet panna cotta with a gorgeous granny-smith apple gel and cinnamon crumb. 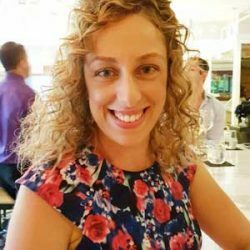 Om Nom’s high tea menu is a bit like Alice in Wonderland falling down the rabbit hole – where traditional is out and everything is curiouser and curiouser, but in a delightfully fun and enchanting way. 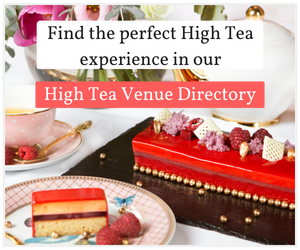 experiences in our High Tea Venue Directory.